As a blogger, I certainly spend more than my fair share of time on the computer. From editing photos, writing posts, researching articles and project ideas, to promoting my work (and others’!) on social media and a whole slew of personal stuff, these days it feels like I am at the computer more time than I’m not. 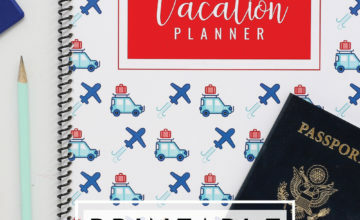 While I am far from a computer technical guru, I have found some ways to streamline my processes and keep my computer organized so that I can find and work with my files quickly and easily! 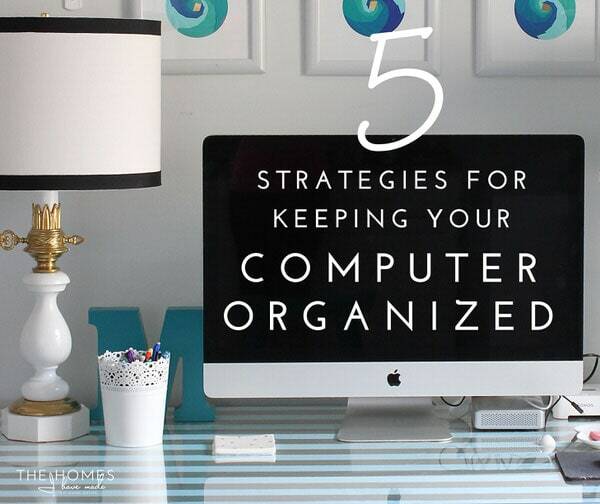 On this “Printable Tuesday,” I thought I’d step away from the more hands-on organizing solutions and show you some of my tried-and-true ways for keeping my computer organized! 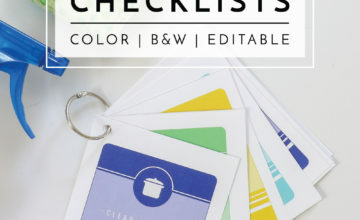 Over the past 8 weeks, I’ve come up with all sorts of printables to share with you guys. Some of them were made due to reader requests, and others were made out of a need I had in my own life/home. Today’s printable is the latter. Like many of you, I feel like I am logging in and out of websites all the time…and more often than not, I am always submitting to get my username or reset my password because I can’t remember which one I used where. And this problem is much exacerbated by the various sites, platforms, accounts and databases I maintain for the blog. 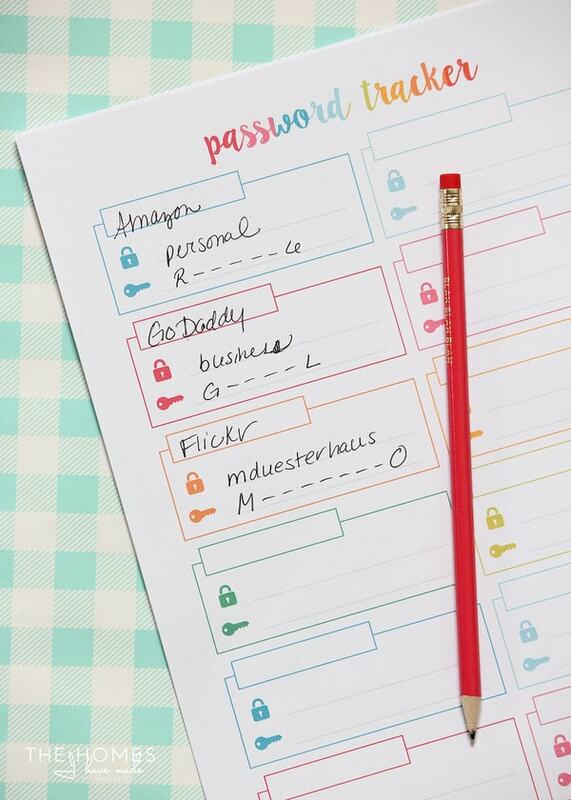 I decided enough was enough and made myself a pretty password tracker printable…and am sharing two different versions with you guys today! 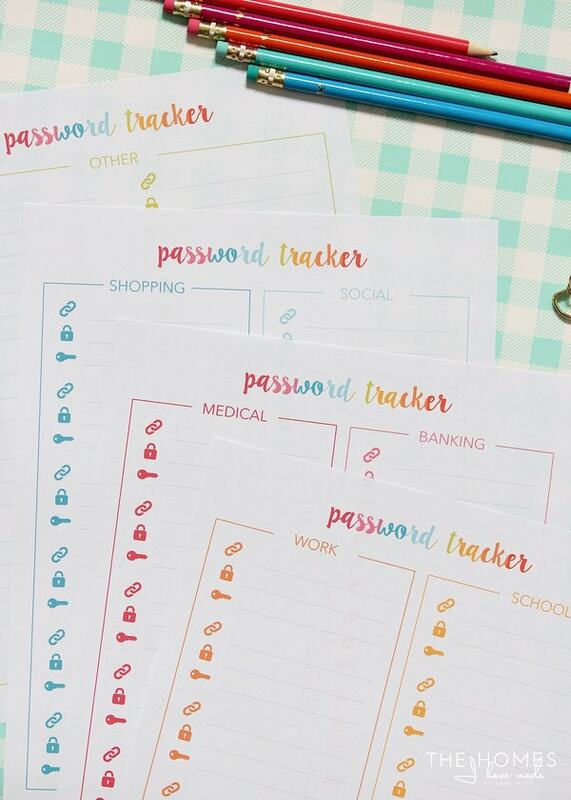 This week’s printable kit includes both a general password tracker as well as a categorized one…5 printable pages all designed to match the other printables in this series! 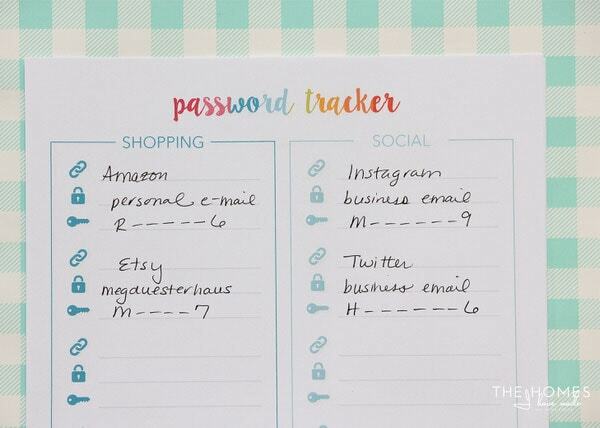 The “general” password tracker is just that…a tracker with no categories or labels and you can use it for whatever sites/accounts you need it for! Now, I do want to note that account names, numbers, and passwords are private and secure information that should be protected. Most security experts don’t recommend writing them down; but honestly, the second I clear my browser for one reason or another, I’m locked out of everything. So I’ve been wanting and needing a cheat sheet for quite some time. To keep these hand-written trackers safe without having to put them away in a safe, I fill them out with hints instead of actual account names and passwords. So much is done by email, so I denote which email was used and then give myself a little hint to remember the password. Even just the first letter is enough to jog my memory! The above trackers have little boxes for you to write in the name of the website or account and then the lock (username) and key (password) lines. 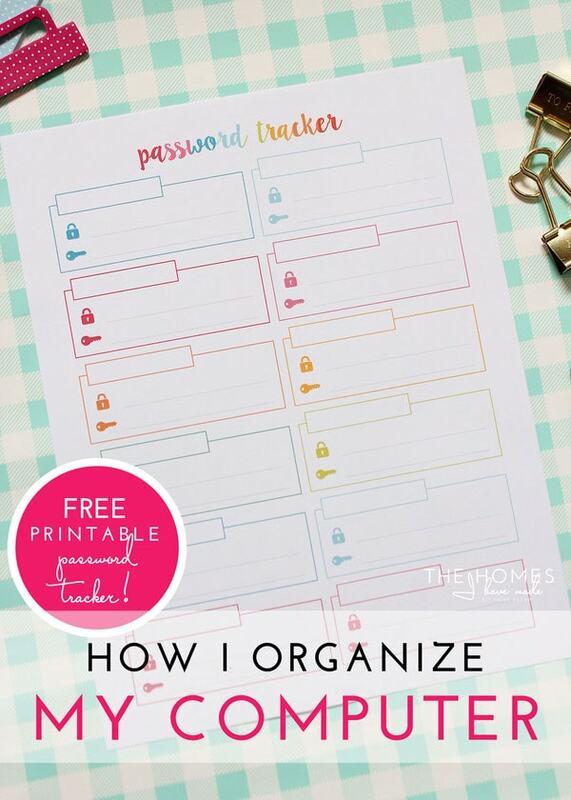 In the categorized trackers below, I included three separate lines to be filled out as follows: The categories included are WORK | SCHOOL | MEDICAL | BANKING | SHOPPING | SOCIAL | OTHER. 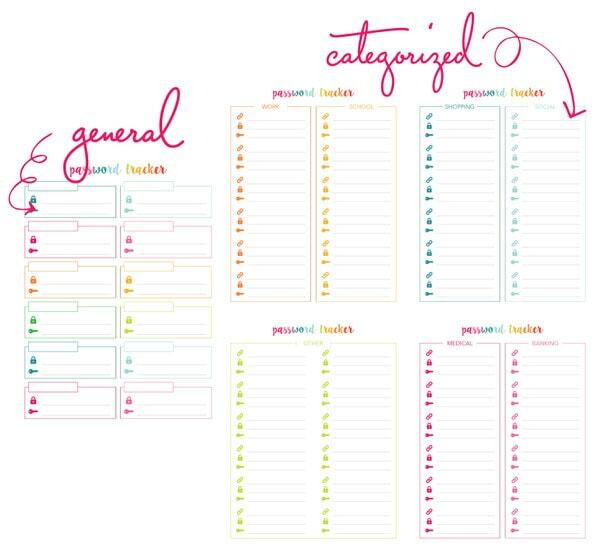 Print out as many as you need for each category and fill them up as you come across new accounts! 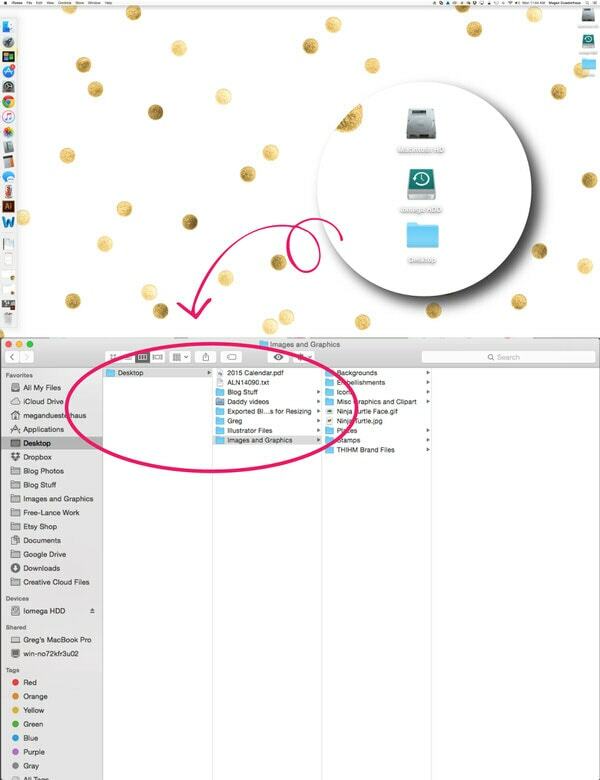 While I’m talking tech-related organization today, I thought I would share a few other quick and easy tricks I’ve started using to help keep my computer organized and my files easily accessible! The first is a problem I think we all have…keeping our computer desktop clear! Saving or dropping files onto the Desktop is surely the easiest and quickest option when you are working on something actively. But it doesn’t take long for your desktop to be overrun with files, leaving it looking cluttered and you unable to find anything! Below is a glimpse of my computer desktop…notice that it is CLEAR with three small files in the upper right-hand corner: one is my computer, one is our hard drive, and the third is a file that says “Desktop.” Instead of having dozens (or more!) files and folders spread all over my desktop, everything gets dropped into that folder. That way, it’s still on my desktop, but dropped into a single bucket. Oftentimes it’s quite disorganized, but once a week or so I will go in and put things into the right files. This tiny little trick of making a dedicated “Desktop” folder ON the Desktop seems silly and trivial, but it has made a big difference for me in keeping my desktop tidy! For the longest time, I had one, long list of bookmarks that included everything form photo sites, blogs I read, shopping sites, recipe sites and more. Finally, I sat down one day and organized them all into categories that made sense. Oh my gosh – what a game changer. 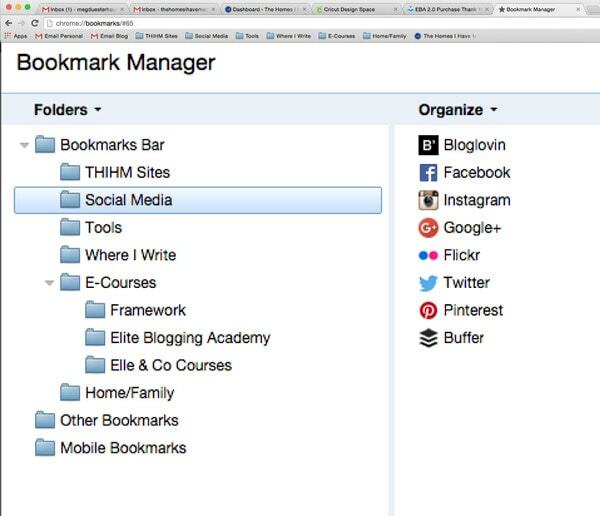 I’m partial to Google Chrome, and the Bookmark Manager is really easy to use and you can drag and drop, make folders, etc with ease. I am pretty sure most browsers have the same capability. Using Chrome also allows me to sync across all my devices, so whether I’m on my computer, laptop, phone or tablet, all my bookmarks are there and organized the same way! Again, something so simple and obvious…but there are SO many different sites and programs I use on a daily basis, that this simple little step saves me so much time! When you upload photos from either a camera or phone, don’t load them into an album right away. First go through the uploaded photos and flag all the “worthy” photos. These photos should then get put into a dedicated albums/folders with a descriptive title and an obvious feature photo. After decent photos are set into an album, immediately delete out any and all bad/extra photos. Do this with every.single.upload. Whether it’s family or work, I get rid of the bad photos as soon as they are uploaded. If I wait, I never go back and before I know it, I have too many photos to go through. If you take a lot of photos and purge as I suggest above, empty your computer trash weekly. Consider separating out family photos from work/home photos as necessary. I have all my personal photos separate from my blog photo database. Backup photos onto an external hard drive or upload to a photo site for safe keeping and easy access across devices. Whether it’s photos for posting to Instagram on my phone or an e-book I want to read on my tablet, I find that I am constantly shuffling documents back and forth across devices. Gone are the days of thumb drives, and cloud-type services are the key to making everything you have/need accessible all the time. I personally am partial to Dropbox, and use it ALL the time. 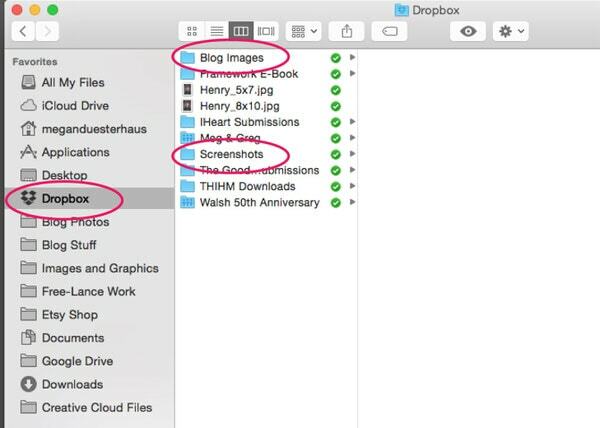 I have Dropbox loaded onto all my devices and can easily bring up PDFs, Word documents, photos and more without having to text/email them back and forth. 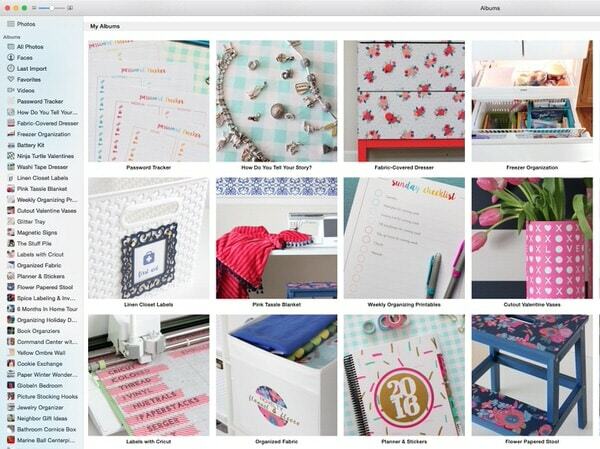 Admittedly, Dropbox has become my quick drop and access spot for many of my files…sometimes even more than my Desktop! What’s great is that since it’s limited by size, I am forced to go in and clean it out on a regular basis! 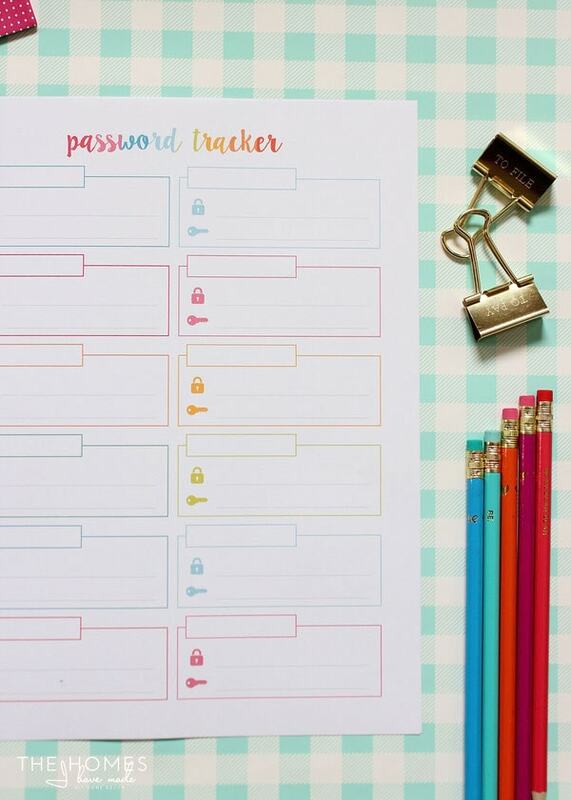 These Printable Password Trackers have been uploaded to The Organization Toolbox and are available for download right now! So there you have it! 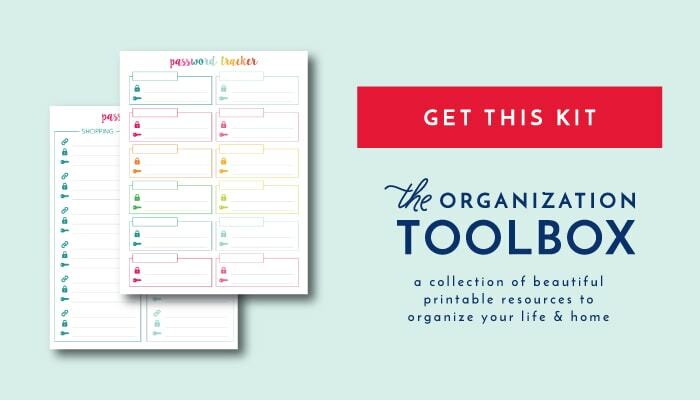 Nothing overly technical or too hard, but some tips and tricks for keeping the digital side of your life a little more organized! Do you have tips to you use and love? I’m always looking for ways to streamline my process, so please share in the comments below! See you back here Thursday with my next dresser makeover! I shared a peek on Instagram..so check it out here if you missed it! Thriving and Surviving Military Life: How Do You Tell Your Military Journey?